Sometimes all we really need in life is a spot where we can sit back and relax. It doesn’t matter where you are, if you’re going to relax, you’re going to want to be comfortable, right? Of course, you do! It doesn’t matter how beautiful the scenery may be if your chair is uncomfortable, you can’t possibly enjoy the peace and quiet. That is where Adirondack chairs come in. Many people prefer these types of chairs to relax in because of their wide arms, roomy seats, high backs, and gentle recline. Oh, and we can’t forget that they are quite stylish, too. All in all, they are the complete package! 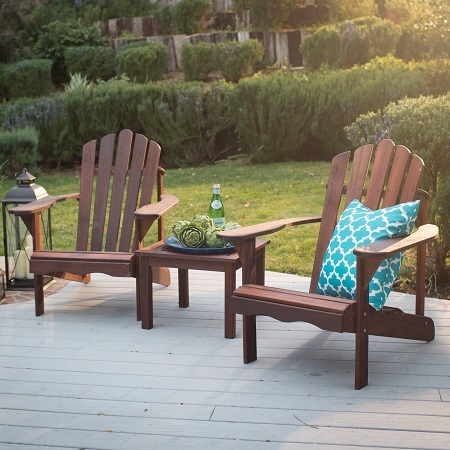 The Richmond Adirondack Chair Set is exactly what the doctor ordered if you’re looking for an affordable set of outdoor furniture, as it comes with two chairs and a matching side table. 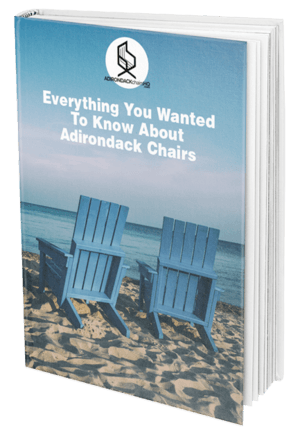 In this article, we are going to give you an in-depth look at the Richmond Adirondack chair set, talk about what people are saying about the set, and give you our recommendation whether you’d want to consider purchasing the set or not. 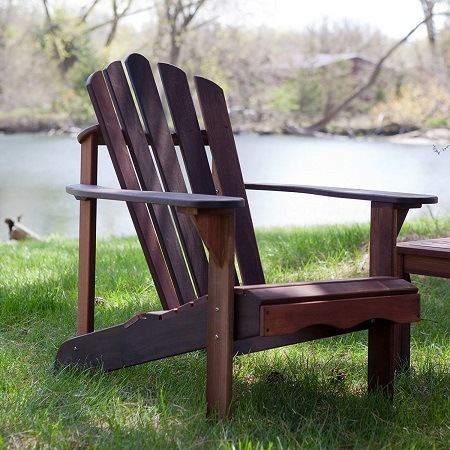 This Adirondack chair set is manufactured by the Belham Living company, which became a trademark of Hayneedle, Inc. in 2013. 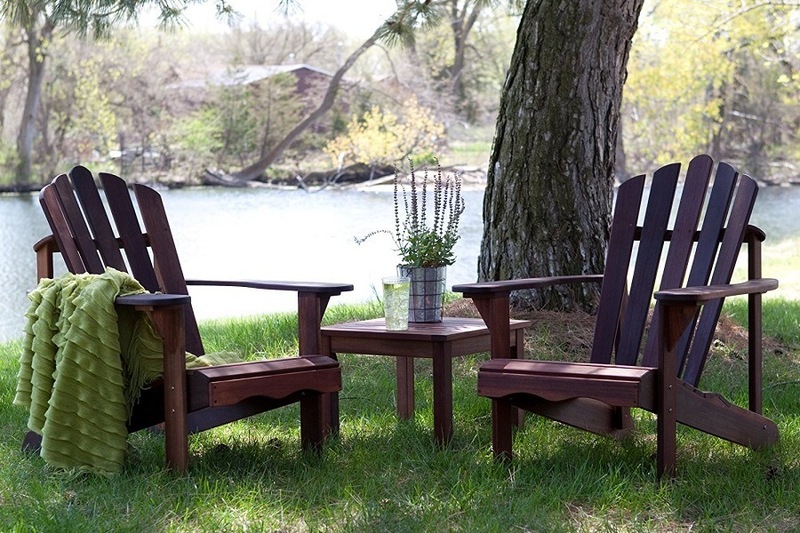 Belham Living has created numerous furniture sets for around the home, but they are well known for their outdoor furniture pieces, such as the Richmond Adirondack chair set. 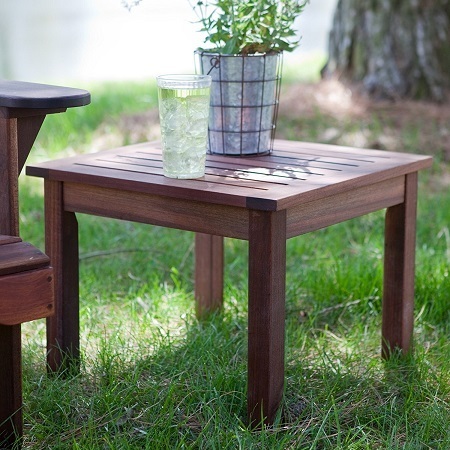 When you purchase this set, you will receive 2 Adirondack chairs and a side table that are made of red Shorea (red Lauan) wood, and it is finished with linseed oil. The benefits of having a set made from this particular wood are that it is very durable and is able to resist insect infestations and rotting, but it will also be impermeable to water, so you’ll be able to enjoy the set for years to come. These sturdy chairs have a weight capacity of approximately 300 pounds so you can rest assured that anyone can sit in the chairs comfortably. When we took a look at the reviews left by people who purchased the set on Amazon, we were pleasantly surprised. 94% of the people left 4 or 5-star reviews. Of these positive reviews, there was a common theme when they talked about the product. The chair is heavy, sturdy, and quite comfortable. 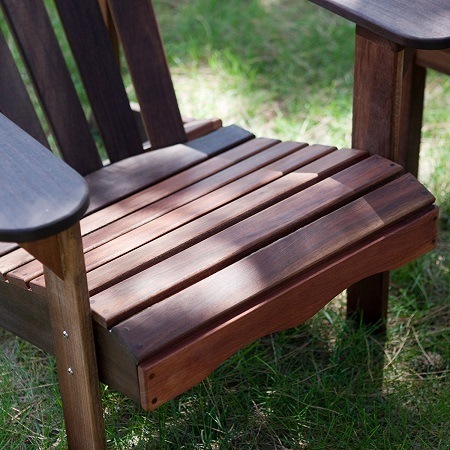 The chair does require some TLC if you want to maintain the freshly stained look of the exotic wood. The chair’s armrests were the perfect width to hold a glass of something cold to drink. The chairs were easy to put together once they had a picture in front of them for a visual of what it should look like, nor did it require any modifications like some other chairs available on the market. After only three months of gentle use, the chairs already show signs of cracking around the bolts, as well as on the arms and legs. Customer service was not helpful. The stain on the chairs was poorly done and only after two months outside, they look several years old due to fading and splintering. Assembly took longer than they liked (approximately 30 minutes per piece) and the directions were not easy to follow. When we are purchasing outdoor furniture for our home, we want a product that we are going to get plenty of use out of, especially if we are going to spend just under $290 on a set of Adirondack chairs. When we look at all that you get with this set (2 chairs and a side table), it seems like this set is a wonderful deal. And it is! Shorea wood is known for being one of the sturdier hardwoods, thus making the entire set strong and quite durable. Also because they have such high density, they are more impermeable to water so you can leave them outside without worrying about the integrity of the chairs. On top of that, the wood is known for being resistant to rotting and becoming infested with insects. 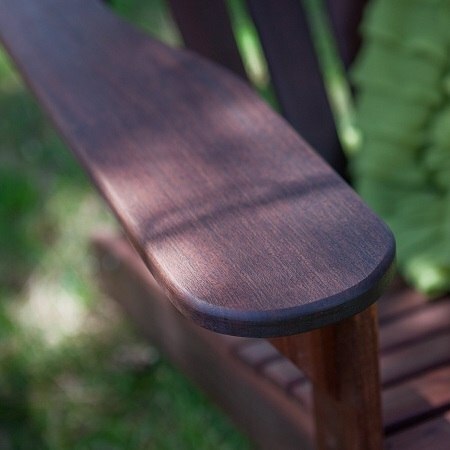 Which are both possibilities with other wooden outdoor furniture pieces? When we look at the reviews left by verified purchasers of the set, we see that the vast majority only had good things to say about the set. They confirmed that the set is constructed well, they are sturdy, and they are relatively easy to assemble. All in all, they are very pleased with their purchase. Of the small handful of reviewers who didn’t enjoy their purchase, we think that perhaps they received the rare defective product. Since it is only 6% of negative reviews, it is safe to say that the chances of the set you receive (if you decide to purchase) will have similar problems. When we take all of this into consideration, we fully recommend purchasing this set. Not only are you getting a great deal on three pieces of outdoor furniture for less than $300, but you are getting a set that is made from a high-quality hardwood that is going to be a beautiful addition to your home for years to come. All you have to do is figure out where on your property the set is going to look best!